I got given a beautiful gift from a Yoga Teacher who had done Yoga Teacher Training & Mindfulness Based Restorative Training with Yoga NRG. It was a book of Zen stories. The book was to say Merry Xmas and Thank you for helping him get back doing what he loves, teaching Yoga when he thought he may never be able to teach again after a brain hemorrhage. One of the themes in the book was about acknowledgment and praise. As I sat this morning with my cup of tea, meditating – I noticed my mind being pulled to open this Xmas/Thank you Present (early;) or start putting together a 70-90’s playlist for a Charity Yoga Class to raise awareness/funds for Motor Neurone Disease. Both thoughts/urges had a little tug on my mind strings as I sat to meditate. (After all, Meditation is not about trying to stop your thoughts from happening) – in Mindfulness the initial suggestion is to be curious about thoughts without judgment. As I curiously watched the mind, ‘thinking’, I wondered about our relationship to acknowledgment and praise as a collective, as a society. In this country (in Australia) it’s not cool to blow your own horn. Fully aware there is a fine line between curiously watching thoughts and being hooked by them. I made a deliberate decision to see where the contemplation lead. Watching the breath, the mind, just sitting. An urge came up to want to open the ‘gift’, I put the kettle on for a second cup of tea, (possibly a familiar habit;) and opened the gift. Today wasn’t the day I was going to strengthen patience (or urge surfing for that matter) – and it didn’t matter . I took another sip of my tea and then a song from ‘back in the day;’ popped in ….. I remember returning home from training ( tear you down to build you up type training) in Hawaii, the Undercover Yogi waiting at the Airport for me. On the journey home, he said: “So what did you learn mate”? The Undercover Yogi ~ “Resistant, I could have told you that for free! ” we both started laughing. (kind of;) another bicep curl for my sense of humor and humility. There are times where hearing the truth about aspects of our nature (whether it be resistance or desire for acknowledgment) can come from a place of love and kindness, where there is encouragement and acceptance. And other times where it may come from a slightly different place that can create more resistance in the mind and heart. There are times where we focus on “what’s wrong with us” and treat it as a defect, something to be ashamed of or “worked on” or something to get ‘rid’ of. To the point where we may need to sign up for ‘more training’ or told that we do. So as I finished this Zen story, finished sipping my second cup of tea, the urge to check “What was the rest of the lyrics to that Fat Boy Slim Song? Funny how we have to hear the same thing in different ways and repeatedly for it to finally sink in. 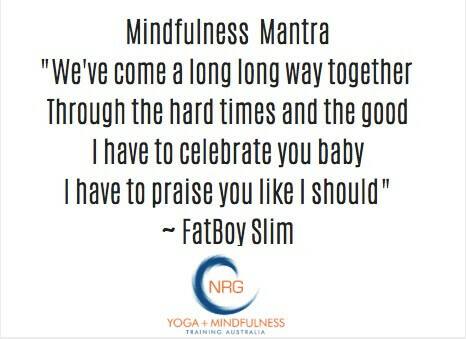 Perhaps both Fatboy Slim and Ajahn Brahm were onto something. Perhaps offering encouragement to others and yourself is where Mindfulness can truly begin…. Repetition helps us with that. The more we repeat something in the mind, the more it will respond to that message. The neural pathways (think of it like grooves in the mind) get deeper so if we are constantly putting ourselves down, (the opposite of praise) those neural pathways are the ones that will fire more of the time more easily – and you can get bogged in them. If we feed something it gets stronger if we don’t it starves and dies ~ so maybe all someone does need to feel that little bit stronger is to be told they are doing a good job, and a little bit of encouragement. There are many ways to Teach Yogic Philosophy ….. Some people turn it into a song as a way to share it. Others write a Zen book. Others just offer acts of service, being there to “pick you up” laugh with you and love you for all that you are regardless. Maybe you do not need to spend tens of thousands of dollars on personal development. Maybe the best teachers are those around you every day. To praise them like you shoulddddddddd……. 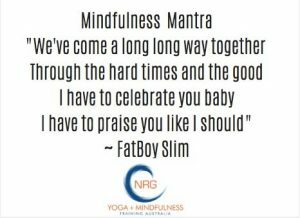 If you find it challenging then roll out your mat and pop on a bit of Fatboy Slim perhaps ~ Mindful Messages can come in all different ways. 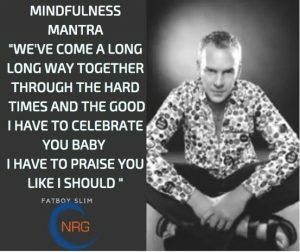 (This is to wish one of our very special NRG Teachers Rosie a Happy 40th Birthday, who lost her Dad to Motor Neuron Disease) her wish is for no gifts , just come practice some Yoga NRG, dress up and all proceeds from Tammy’s Class will be given to this charity. A reminder all funds from Tammys Class will go toward MND ~ Rosies goal is to raise $1000 so feel free to donate on the day direct to Rosie also.